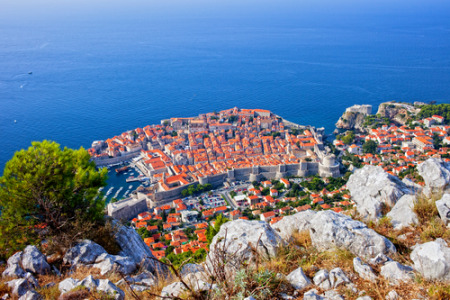 Book a cheap Dubrovnik holiday and enjoy the beauty of one of the world's most charming medieval walled towns. Although damaged by the earthquake of 1667, a good number of renaissance buildings were left intact. After the cessation of hostilities at the end of the last century, this world heritage site was repaired using traditional methods to good affect. For panoramic views of the walled city and the Adriatic coastline, take the cable car to the top of Mount Srdj. It's certainly worth the price of the ticket. Dubrovnik has a long season with hot, dry summers. July and August are extremely busy and if you are able to go outside these months, you'll find better bargains and more comfortable temperatures. The old town is pedestrianised so you can explore the narrow streets, admiring the palaces and churches, without worrying about traffic. Be sure to see the Sponza Palace and St. Saviours Church. If you are looking for gifts and souvenirs, the old town is the place to be. Don't forget the market in Gundulic Square. The cuisine of Croatia has been influenced by the countries which surround it an amalgam of flavours that delight the taste buds. Cheap Dubrovnik holidays are very popular with couples of all ages. It is a romantic city that attracts lovers of all ages. It is a favourite honeymoon destination. One advantage of holidaying here is that city explorations can be combined with days on the beach or trips to one of the many offshore islands. If you are tempted by a cheap Dubrovnik holiday but wish to avoid the arduous task of trawling through web page after web page trying to find the best deal, try our simple search facility. You'll find over three dozen travel companies competing for your custom. It is simple to use and remember, competition brings out the best bargains. Our search facility enables you to see, at a glance, the Dubrovnik holiday that is the cheapest and the one that offers the best value for money. All you have to do to secure the holiday is make a phone call. To book the best deal, and to avoid disappointment, ring today.